Even as he rallied for his fellow Democrats in Orange County, former Vice President Joe Biden on Thursday night sought to do some historical damage control. Biden's remarks in the once-red but increasingly purple O.C. included a glancing reference to Supreme Court nominee Brett Kavanaugh's travails, as well as his own role in examining alleged sexual harassment against another high court pick, Clarence Thomas. Biden, who is flirting with a run for president in 2020, chaired the Senate Judiciary Committee when Anita Hill was sharply questioned about her sexual harassment accusations against Thomas, then a Supreme Court nominee. Speaking before a largely young college crowd at Cal State Fullerton, Biden offered his take on his actions following Hill's 1991 appearance before the committee he ran. "When I wrote the Violence Against Women Act, I did it after the way Anita Hill was treated. Unfortunately, seems more appropriate today in light of what's been going on in Washington than it should be," Biden said. Still, his speech overall was less a history lesson and more a rallying cry for local congressional candidates. Oh, and there was also a sharp critique of the Trump administration. "The truth itself is being thrown aside for a cultish devotion of one man," he said. "There's no place in America for giving hate a safe harbor. The world is watching." With just about a month left before the November election, Biden is the latest big-name politician coming out to California to support local Democratic congressional candidates. Last month, former President Barack Obama rallied the party faithful in Anaheim. Biden delivered his own message for party unity, casting this year's election in somber terms and urging voters to change the national political landscape at the ballot box. "This election is much bigger than politics. This is the most important election you've ever voted in. We're in the battle for America's soul," he said. 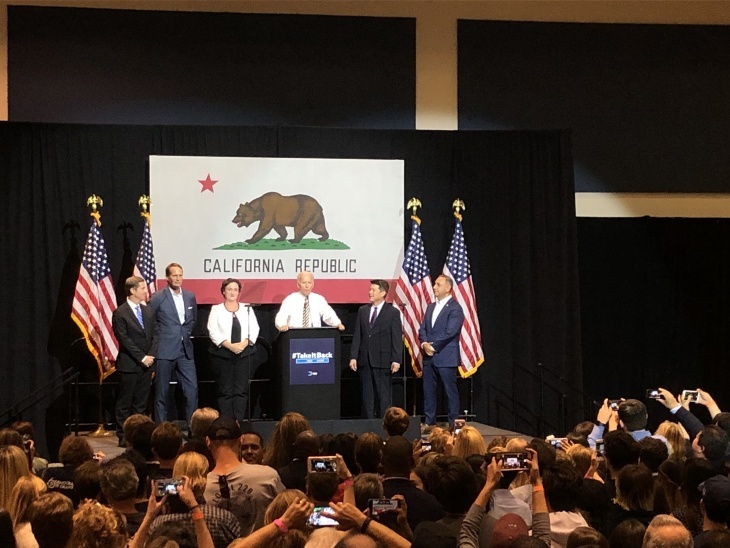 Biden said SoCal seats are critical to the Democrats' push to retake the U.S. House, noting several key races are in areas that traditionally have voted for Republicans. Democrat Mike Levin, running in the 49th Congressional District against Republican Diane Harkey, said voters have given him confidence. "The momentum and the energy is on our side," he said. "They want to see change and they believe our country is better than what we're seeing from our leaders in Washington right now." Democrat Gil Cisneros, a candidate in the 39th Congressional District running against Republican Young Kim, echoed Levin's optimism about his own chances in the midterm election. "By no means do we think it's going to be easy. It's going to be close, but people are behind me. People are on my side, and they want change." Democrats hope to flip 23 seats to retake the House. As many as a third of them could come from California.